Like many young boys, I grew up spending much of my waking hours outside with a frog in my pocket and a stick in my hand. I was born and raised in a small town along the Athabasca River and Muskeg Creek watershed. Mom and Dad encouraged me to learn fishing, hunting, camping, and canoeing, and through that I become proficient with firearms and hand tools such as the axe, knife, various saws, hammer, and nails while building forts, campfires, shelters, and exploring the forest. I had a generous amount of free time to roam trails, climb trees, swim in creeks, rivers, and lakes, and I learned to operate motorbikes, quads, and snowmobiles. I developed strong empathetic bonds with the natural world and dreamed of meeting an old Indian in the forest to learn from. As an adult, I began researching and experiencing the outdoors through hiking, backpacking trips, rock climbing, ice climbing, canoe tripping, backcountry skiing, and mountaineering in the Canadian Rocky Mountains and National Parks. I took courses in avalanche safety, wilderness first aid, mountaineering, backcountry skiing, and mountain leadership and adopted a ‘No Trace’ perspective when travelling in popular recreational areas and parks. 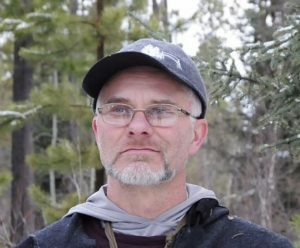 To further my knowledge and skills, I attended Tom Brown’s survival school (3 levels), Wilderness Awareness School (Coyote Mentoring, Art of Mentoring, Naturalist Training level 1,2), and took a few weekend workshops from Mors Kochanski. My desire to find an old Indian mentor led me down a journey of exploration into Native teachings and spirituality, and so I began learning from various elder teachers and eventually a Sioux Medicine Man who mentored me through ceremony and rituals (sweat lodge, vision quest, yuwipi, and sundance ceremonies). After 17 years, I felt I’d reached the end of this path and I moved on. I began teaching outdoor programs as a volunteer and as a paid instructor for many clubs, schools, and special interest groups across Alberta. Somehow, I developed a reputation as “Nature Boy” and through word of mouth, I found myself to be called upon all year long for programs pulling content from my great diversity of outdoor skills and knowledge. In 2003, I was hired as Program Director and eventually became Director of Camp Encounter – a year-round outdoor/retreat center run by the Catholic Church. It was here that I catapulted my experience as an instructor by offering programs such as archery, rock climbing, ropes course, canoeing, tipi camping, outdoor skills, leadership workshops, religious retreats, and team building initiatives to close to 3000 visitors per year. I also joined the local Search and Rescue group and was rewarded with excellent training such as Mantracker, Swift Water Rescue, Team Leader, SAR Fundamentals, and Wilderness First Aid. This is also where I began facilitating Drum Circles as a recreational music making and fun experience for groups of all ages and backgrounds. In 2007, I started up my business “Nature Alive” and together with my wife, Colleen, we continue to offer programs throughout Alberta. ‘Nature Alive’ is a multi-faceted school offering numerous levels of Survival Courses, Bushcraft Courses, and Outdoor Education workshops, as well as Guided Canoe Trips, National and Provincial Canoe Certifications, Recreational Drum Circle Facilitation and Djembe Instruction.